What do the NFL Draft and a paralegal have in common? Some of you may be aware of the NFL Draft, which begins tomorrow, April 30, 2015, and runs through Saturday, May 2, 2015. Others of you may have your televisions temporarily hijacked (as I know I will) and find yourselves involuntarily watching it…or at least pretending to. That said, I do admit it’s pretty darn cool to see people’s dreams coming true while cameras roll. A LUCKY NFL fan from London will be swapping the courts for a television studio to make American Football history next weekend by announcing two picks on behalf of the Jacksonville Jaguars in the 2015 NFL Draft live from London. 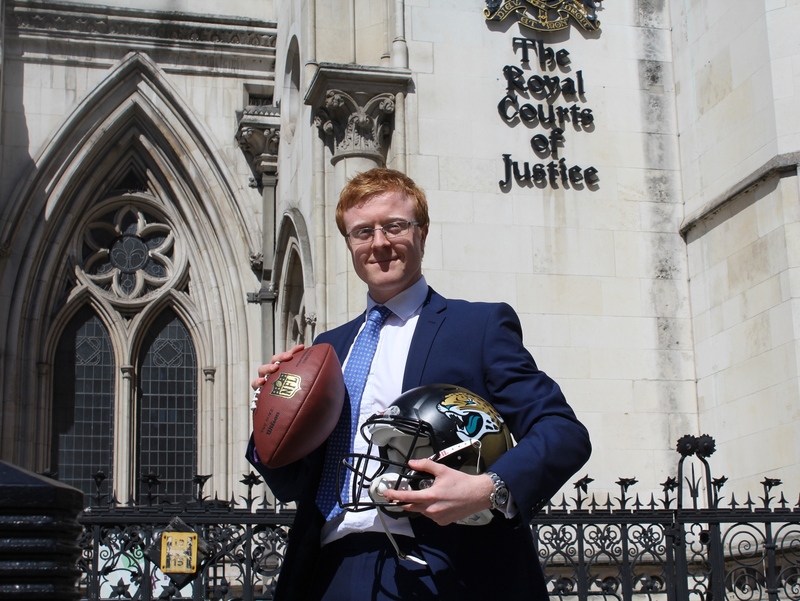 London will be the first ever city outside of the USA to play a part of the NFL Draft with Paralegal George Bedford announcing the Jaguars’ sixth and seventh round Draft picks from a London TV studio having won a competition run by the team. The NFL Draft is a major weekend in the NFL calendar when all 32 teams compete over seven rounds to select the best college players. Given the Jaguars’ commitment to play one home game a year in London over four seasons, the team wanted to honour their UK fan base further by offering one fan the chance to play a key role by making the live TV announcement from London. Bedford, who works for Leigh Day in Farringdon, will be revealing the name of the Jaguars’ sixth and seventh-round draft picks to millions of viewers as part of a live broadcast via Sky Sports News in the UK and NFL Network in the US on the evening of Saturday 2nd May. You heard it here first, folks. And I must admit I love the picture featured with today’s post! So whether you find yourself eagerly watching the NFL Draft, or involuntarily watching it (like me), be sure to keep an eye out for the 6th and 7th round pick of the Jacksonville Jaguars on Saturday, and give one lucky paralegal from London a silent paralegal salute. UGh I’m dating a new guy who is a HUGE Pats fan. Guess I’m going to be a football widow long before I expected it, eh? But I had no clue we had NFL fans in London. That’s pretty cool, and I hope George makes some good picks for the team!